Use the up & down arrows on your keyboard to read whole article. Each year it seems that there are more and more movie titles being offered in 3D. No, this is not the red and blue, plastic glasses 3D of yesteryear but rather newer generation 3D technologies. From a slew of CGI animated children's movies to action and even horror movies, there seems to be no slowing down our appetite for 3D cinema. The entertainment industry and consumer electronics giants such as Sony are betting the bank that consumers will want to bring 3D movie technology into their homes too. Samsung, Panasonic and the aforementioned Sony have all released 3D capable televisions in 2010 and Blu-ray ratified its own 3D specification meaning that HD 3D finally has arrived en masse. Industry sources trend 3D capable televisions to be commonplace in American households with the next five to ten years. such as Bwana Devil, Hondo and even Alfred Hitchcock's Dial M for Murder being shot in this format. medium back to a new generation of audiences. s envisioned to be the future of sporting-event television coverage. 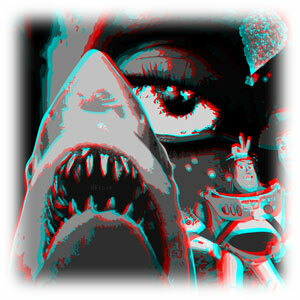 Stereoscopy is the general method for providing a three-dimensional optical illusion with two-dimensional images. Depth perception is simulated by providing each eye with a different image of the same vision field. These two images represent the slightly differing perspective for each eye in binocular vision as caused by the distance between the eyes. Our brain naturally combines the two images into one, which we interpret as having depth. This type of 3D operates by displaying two images on the screen: typically one in red and the other in blue. The glasses are used as subtractive filter and allow only one image to enter each eye. The images are combined in the brain to appear as a single black-and-white image with simulated depth. Polarized lenses improve on red/blue technology since they allow for color images. 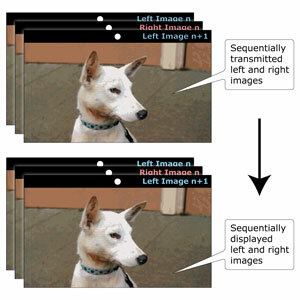 This 3D method works by displaying two separate and orthogonally polarized images on a screen. The user wears glasses where the polarization of each lens is orthogonal to the other as well. As a result, this method acts as another type of subtractive filter where the two images are combined in the brain into a single image with simulated depth. 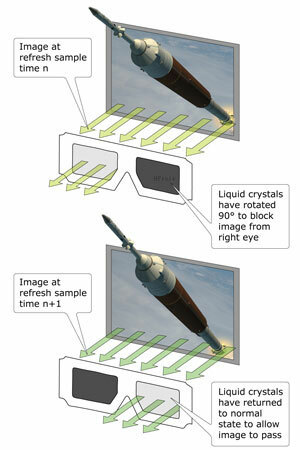 This latest generation 3D uses powered glasses to provide the simulated stereoscopic effect. Unlike previous technologies, active shutter glasses allow for uncompromised video quality in both color and bandwidth. In short, this means that 3D video can now be displayed in full HD quality with the right equipment. Active glasses operate by embedding synchronized shutters within each glass lens. The two shutters are opened and closed in a staggered pattern meaning that when the left eye's shutter is open, the right shutter is fully closed allowing no visual information to pass. On the next time sample, the process is reversed. The timing of each eye's shutter opening is synchronized with a corresponding perspective image to simulate the depth field. This method of operation has two negative side effects: The refresh rate is automatically halved and with too slow of a refresh rate, the user will see image ghosting. However, the latest 3D HDTVs eliminate both of these problems by doubling the normal refresh rate to 120 Hz allowing for a full HD 3D experience. The shutters themselves are typically constructed of LCD displays which can transform from being transparent to nearly opaque black when a control voltage is applied. The control voltage is synchronised with the alternating sequence of left and right images on the television via Bluetooth, DLP Link, IR or RF signals depending upon the equipment manufacturer. In order to enjoy 3D video at home, consumers will have to upgrade most of their current equipment. First, a 3D capable HDTV is the obvious prerequisite. sure their A/V cables are 3D capable as well. This is covered in detail in the following section. 3D "sunglasses" in front of family and friends. 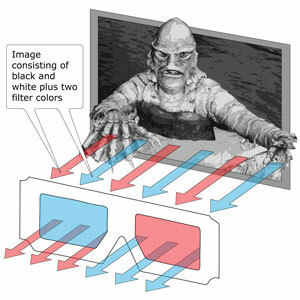 television: sequential and side-by-side 3D. versus Betamax in the early 1980s. DisplayPort is the computer industry's answer to HDMI and has been envisioned as a replacement for DVI. 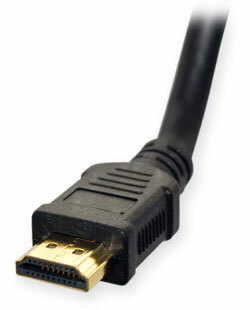 Introduced in 2006, DisplayPort is a unique, high-bandwidth digital A/V cable that can connect both internal and external displays. In 2009, DisplayPort 1.2 was released and allows for the doubled refresh rates needed to support HD 3D with higher bandwidth from the previous version 1.1a. In version 1.2, the data rate was increased from the already high 10.8 Gb/s to up to 21.6 Gb/s. Additionally, it now provides improved HD 3D support through 240 frames per second video (120 frames per second to each eye) as well as displaying the following 3D protocols: dual interface, field sequential, pixel interleaved, side by side and stacked. For more information on DisplayPort, read our November 2009 technical article. 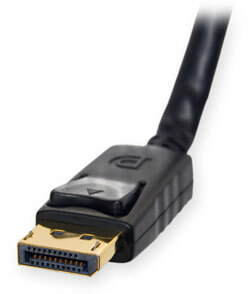 HDMI, the all-purpose, digital audio/visual cable for home entertainment, also has embraced 3D technology with its v1.4 also released in late 2009. This protocol established the necessary infrastructure to deploy 3D between cable/dish TV boxes, Blu-ray players and HDTVs. HDMI allows for a full HD 3D experience like DisplayPort with resolutions of up to 1080p all the while supporting seven-channel surround sound. 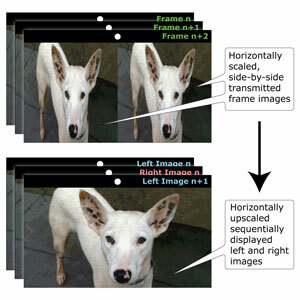 Moreover, HDMI's 3D support currently covers: frame, line, or field alternative methods; side by side methods (full and half) and 2D plus depth methods. More information on HDMI v1.4, including its 3D capabilities, can be found in our April 2010 technical article. on the recently unveiled Nintendo 3DS portable game console. Q:Will there be 3D video games? hardware to play 3D games in the near future. Sony is looking upgrade its entire game lineup to 3D via a firmware update. Q:Will I get a headache from watching 3D TV? 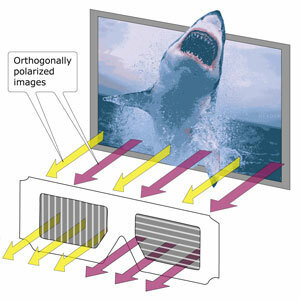 the majority of consumers can watch 3D without any negative effects if they learn the "trick" to watching 3D correctly. (this is almost always where the action is) rather than the background details. Q:If 3D is the big thing now, is hologram based TV on the horizon? fully-functional prototypes are ready for public viewing. 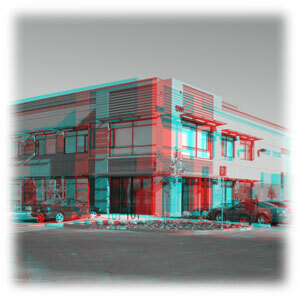 Anaglyph: A method of encoding a three-dimensional image in a single picture by superimposing a pair of pictures. Ghosting: The motion blur created by slow response times of digital televisions while displaying fast motion sequences. IR (Infrared): A data transmission signal which uses electromagnetic radiation with wavelengths between 750 nm (visible red light) and 0.1 µm (microwave). LCD (Liquid Crystal Display): A thin display made of electronically-modulated liquid crystal pixels which form an arrayed subtractive or reflective light filter. Orthogonal: When two vectors intersect at right-angles. Parallax: A difference in the apparent position of an object viewed along two different lines of sight and is measured by the angle between those two lines. Polarization: A property of light waves that describes the orientation of their oscillations. RF (Radio Frequency): Data transmission signals which use electromagnetic waves with frequencies between 30 kHz to 300 GHz. Stereoscope: An optical device used to view side by side stereo image pairs. Viewing both images simultaneously through a stereoscope produces a single image with the optical illusion of three-dimensional depth. Need a PDF version of this article? Like this article? Show your love by liking it with Facebook!